I am pleased to share that recordings of poems from the project Armour are now on-line at Soundcloud written and read by veterans and/or people with experience of homelessness. 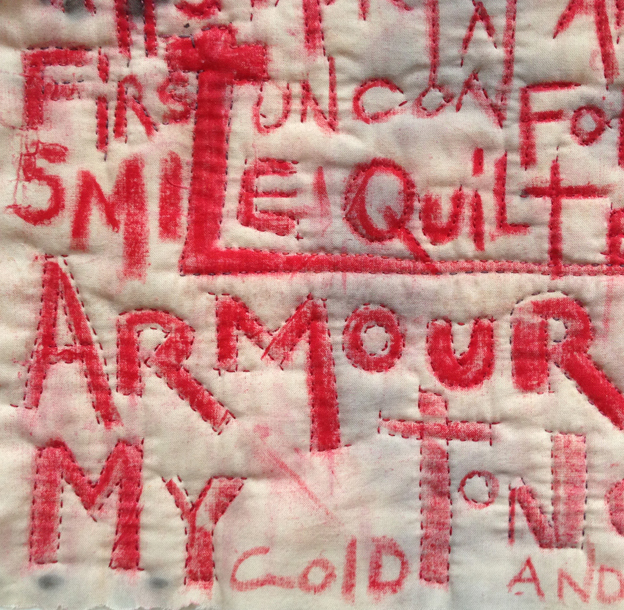 Armour is a project that uses words and stitches to explore the ways we protect ourselves. 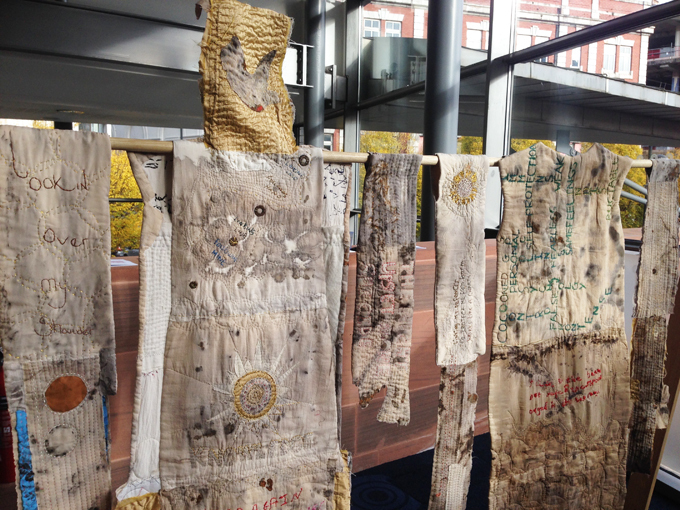 It is a collaboration with veterans of armed conflict and with people who have lived experience of homelessness. We asked people to describe their personal “armour”, physical and mental. Artworks inspired by gambesons, the quilted jackets worn under suits of armour, were made out of rust dyed fabric and embroidered with poems, and other writings. We would like to thank the many people who participated for their bravery and honesty. We’d also like to thank our guest poet Johnny Woodhams and singer songwriter Matt Hill, The Quiet Loner, for leading some workshops, our wonderful team of volunteers, including Melanie Miller, Marc and Jessie. And finally, we are grateful to the Booth Centre, Imperial War Museum-North, The Royal Armouries Leeds, Gallery of Costume Manchester, Walking with the Wounded and Tom Harrison House for hosting workshops and the Arts Council England for supporting the project. 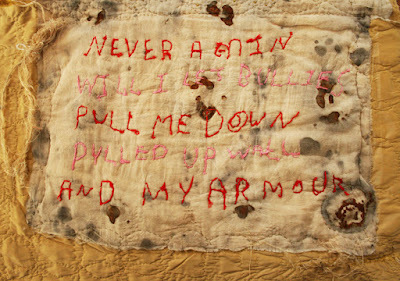 Armour is a project that uses words and stitches to explore the ways we protect ourselves. It is a collaboration with veterans of armed conflict and with people who have lived experience of homelessness. We asked people to describe their personal "armour", physical and mental. 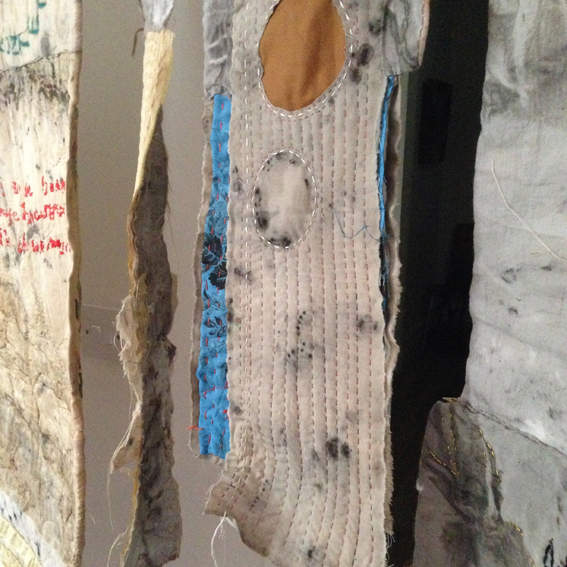 Artworks were inspired by gambesons, the quilted jackets worn under suits of armour, were made out of rust dyed fabric and embroidered with poems, and other writings. Many people we met were veterans who have also experienced homelessness. We asked people to describe their personal "armour", physical and mental. And to imagine what might happen if was taken off. That spark of imagining is what gave life to these poems. Out of much heart-searching, during the art and poetry workshops, came many pieces of writing. 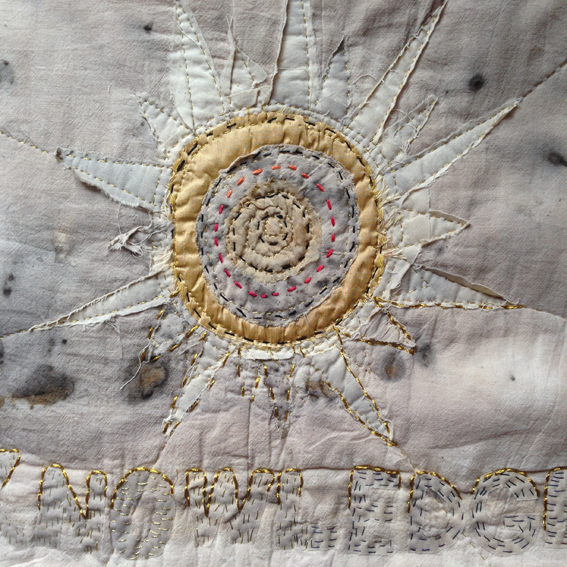 Some were embroidered, or inscribed on suits of armour made of cloth. Although we all need protection, sometimes protection becomes the problem. Armour can be extremely heavy, it limits sight, sound, touch - and emotions. In the poem Sir Galahad by Tennyson, the crucial moment comes when the famous warrior realises if he is to let in love, he must remove his armour. But to do so is fearful as well as freeing. Imagining the absence of armour was a difficult sometimes frightening exercise. For some, it took tremendous courage to write about it. For others, it brought relief. And for others again, many questions. How can people who've experienced physical and psychological violence live peacefully with their memories? In our workshops we discussed how we protect our deeper selves and how we heal. 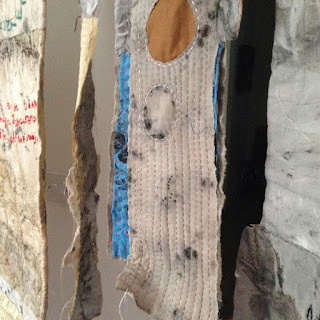 This project was devised to allow emotional/artistic exploration of difficult areas of personal history. The poems come out of the experience of conflict - but our hope is that they might help people to find some peace.